PlayCDG SP is the 2nd generation karaoke player bringing together the custom background images with karaoke singing. Your favorite pictures can now be shown in still frames or slide shows, as background or foreground to the CD+G graphics. Surprise your friends and guests with captured moments that can be exhilarating, inspirational, embarrassing, and advertising. PlayCDG SP plays CD+G discs and MP3+G, MP3 + CDG, and MP3 + MCG files extracted from the CD+G discs. PlayCDG SP also plays the Super CD+G discs (Commercial & Home-made). Simply queue the songs from the Super CD+G disc's songlist. Also enjoy the features of Equalizer, Key Control, Tempo Control, Drag-in Play, Hot Key Controls, Enhanced Play List, etc. for your karaoke. Note: All sales of software products are final without refund. We recommend that before purchasing the full version you download a Free Demo Version of PlayCDG SP for your trial. Made by Encoder MCG program or downloaded from Download CD+G songs. Play Audio CDs and MP3 files. Use your own digital pictures (jpg, bmp). Load up to 20 background images. Edit the Image List (Add, Delete, Re-order, Random, Import, Export). Control display time per image. Select an image by Stop, Next, and Previous commands. Key Control, Tempo Control, and Speed Control for both CD+G disc and MCG/CDG file playing. Equalizer with 8-Frequency blocks and Auto-Adjustment pre-amplifier. Voice Cancel (L, R, Stereo Channels). Add individual songs or folders of songs. Remove selected songs or all songs. Quick Add (Search from selected folders to Quick Add songs to Play List). Load / Save a Play List. Select Continuous / Single Song Play Mode. Direct Key Controls (Hot Keys). Enhanced Status Display (Indicators, Play Time, Song Title). Microsoft DirectX 7.0 or higher (download page) for Win 98 or ME. CAVS Song Packages. Order CAVS Song packages! Browse and select songs (files). Play the songs from CD or CD+G disc in the CD-ROM drive. Show INX(SDC+G song list) window. Read INX(SCD+G song list) from SCD+G disc. Display track, time, status, song title information. Go to previous song or previous track. Begin play or pause. Press twice to release pause. Go to next song or next track. Voice Cancel: Select Stereo / Right / Left channels (In Multiplex CD+G songs, vocal recording is found in the right channel, and by selecting the left channel, vocal recording can be turned off). Repeat the songs in the Play List sequentially. When it is on, the Repeat sign will be lit in the Display. Go to previous background image. Pause background image slide show. Go to next background image. Slide right / left to increase / decrease music volume level. Display About, Help, OpenURL, and Preference buttons. Reset Equalizer settings to default values. Lit when the Eqaulizer is enabled. 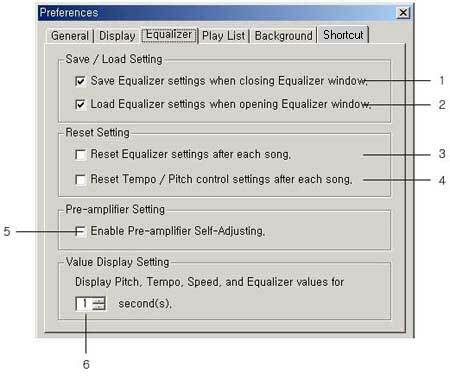 Predefined equalizer settings (PC Speakers, Large Hall, Club, Party). Reset Tempo, Pitch, and Speed control settings to default values. Enable / Disable Tempo, Pitch, and Speed controls. Lit when Tempo, Pitch, and Speed controls are enabled. Sort the songs by alphabetically ascending order. Sort the songs by alphabetically descending order. Select / De-select all songs in Play List. Add a folder to Play List. Add songs (files) to Play List. Quick Add (Search specified folders and add songs to Play List). Clear all songs in Play List. Remove selected songs from Play List. Save current Play List as a file. Load Play List from a file. Select a file type to be at top when using Open (file) command. 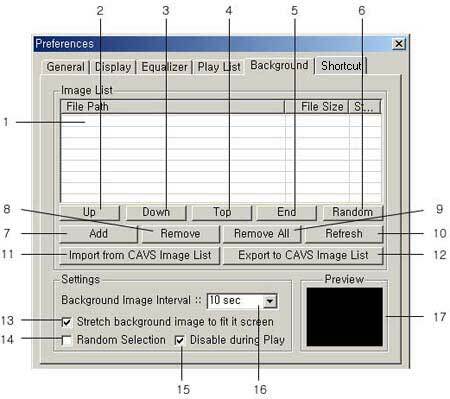 Set the default Left position of the CD+G screen. 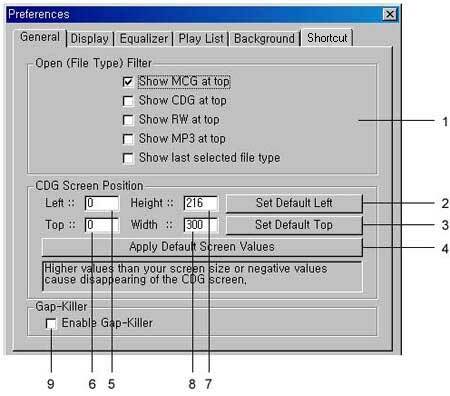 Set the default Top position of the CD+G screen. Restore default screen size (216p x 300p) and default position (216p, 0p). Left point of CD+G screen. 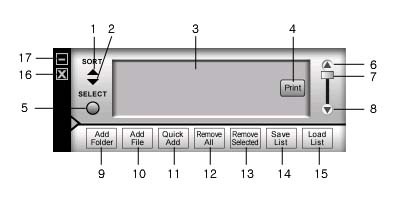 Top point of CD+G screen. Select between Elapsed time / Remaining time in the Display window. Save Equalizer settings when closing Equalizer window. Load Equalizer settings when opening Equalizer window. Reset Equalizer settings after playing a song. Reset Tempo, Pitch, and Speed settings after playing a song. Select the duration time for value display in Equalizer window. Do not add duplicate files to Play List. 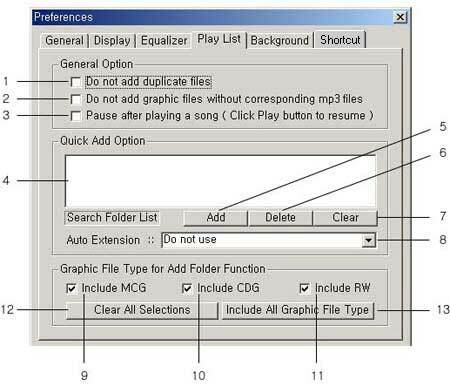 Do not add CD+G graphic files (MCG, CDG, RW) without corresponding MP3 files. Pause after each song is played in the Play List. Resume playing the next song by pressing Play button. Display selected folders within which Quick Add will search for a song. Add a folder to Search Folder List. Delete selected folders from the Search Folder List. Clear the Search Folder List. Add an Auto Extension to a song (file) name being searched in Quick Add. Allow MCG files to be added to Play List. Allow CDG files to be added to Play List. Allow RW files to be added to Play List. Clear file type selections (No graphic file will be added to Play List). 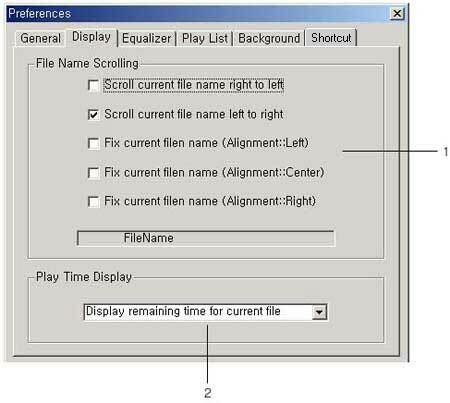 Select all file type selections (All compatible graphic files will be added to Play List). Move the selected image up. Move the selected image down. Move the selected image to the top. Move the selected image down to bottom. Shuffle the order of Images randomly. Add image files(jpg, bmp) to Image List. Remove the selected images from Image List. Export current Image List to a file. Fit each image to the whole screen. Display images randomly from the Image List. Duration time for display per image.